IF YOU DO NOT FIND the right color in our standard selection - or if you require a more exact color match than can be proofed and approved via computer screen - you may want to purchase a Danthonia 'Custom Color Package'. Our artisans are able to custom mix our Dulux paints to match most colours listed on a Benjamin Moore or Sherwin Williams color chart. 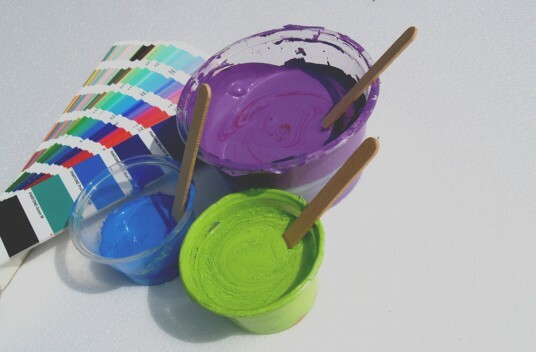 A Custom Color Package allows you to specify up to two custom colors for your sign design. When deciding on colors and color combinations beware that your computer screen is probably not calibrated to professional standards. What we see at Danthonia when we look at your sign design on our screen will probably be slightly different than what you see on your screen. What you see on your screen may be a slightly different shade that the final painted sign. If your sign does not require super close color matching and you are quite happy with 'gold gilded letters on a dark blue panel' then you will have no reason to pay for a custom color. Choose from our standard colors and the hue that you see on your screen will be reasonably close. But if the trim on your house is painted Benjamin Moore Mallard Green or your corporate logo is a PMS 293 and you want to make sure that your new sign matches that color - ask your Danthonia sales person for help. We may find that one of our standard colors is already a close match or we may need to recommend that you purchase a Custom Color Package.